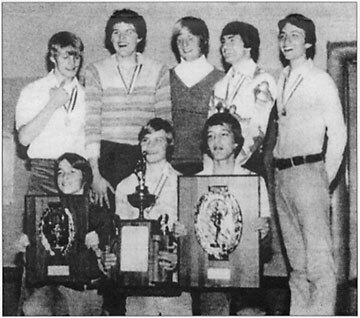 Elmwood High School won the first state championship in the school's history in the fall of 1977 when it won the Class A state cross country championship at Detweiller Park in Peoria. Coached by Tom Meyers, Elmwood placed five runners in the top 50 to finish with 118 points. Right behind Elmwood came Beecher with 140 points, Minooka with 143 and Lebanon with 147. Darryl Dorich finished 14th in 15:20 to lead Elmwood while Rod Andrews was 15th in 15:32. Mark Kissee was 37th, Dan Harlan 38th and freshman Jim Haines 49th to round out Elmwood's top five. Sam Durst came home 99th and Nick Reinhart 132nd. Later Meyers coached Elmwood to three more Class A state cross country titles, his teams winning in 1983, 1984 and 1985.